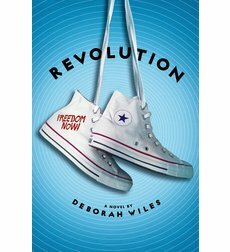 Revolution (The Sixties Trilogy Book #2) by Deborah Wiles. Scholastic Press, 2014. 544 pages. Publisher recommends for grades 3-7. ISBN: 978-0545106078. Revolution is a literary tour de force. Through the voice of Sunny, a 12-year-old white girl, and the voice of Ray, a 16-year-old black boy, both living in Greenwood, Mississippi in the summer of 1964, Wiles presents an exquisitely crafted multidimensional picture of a Mississippi town during Freedom Summer. Most of the story is told by Sunny. She’s having trouble embracing or even tolerating change at home. She loves the Beatles and summertime and her friends. From the time of their first encounter she’s curious about Ray. She’s also curious about the civil rights workers who have come to Mississippi to register black voters. One in particular interests her: Jo Ellen, who is Franny’s sister from Wiles book “Countdown”. People, such as her grandmother, tell Sunny how she ought to think about the civil rights workers and about blacks. But Sunny isn’t one to let other people tell her much of anything. As her life intersects with Jo Ellen’s and with Ray’s, she becomes more and more aware of how unjustly blacks are treated in her town. She also sees the violence towards blacks and towards “the invaders,“ the civil rights workers, on the part of the police force and others in the community. In his part of the story, Ray chafes at the lack of equality in the Jim Crow South. For him, the civil rights workers are moving too slowly. He pushes to see if the Civil Rights Act of 1964 will be enforced in Mississippi almost as soon as it has been signed. The last episode in the book is not surprising. It should be. It should be inconceivable. But the picture of Mississippi in 1964 is so well drawn that when the episode happens it almost seems inevitable. In addition to Sunny’s voice and Ray’s voice there is a narrator’s voice that tells us some things about Sunny’s stepbrother and about Sunny’s father that we wouldn’t otherwise know. And there are pages of nonfiction background about the mid-sixties, including a biography of Lyndon Johnson. As in “Countdown,” there are pages of pictures and song lyrics from the time. I’ve wondered if this switching between four different voices would be difficult for the target age group. My current thought is that this is an excellent choice for a middle grade kid who wants a reading challenge. It’s a great example of what literature can do. Copyright © Elizabeth Parrott, 2014. This entry was posted in Fiction, Middle Grade, United States and tagged Civil Rights Act of 1964, Civil Rights Movement, Deborah Wiles, Freedom Summer, Mississippi by Liz Parrott. Bookmark the permalink. I’m really looking forward to reading this book! Countdown was amazing, and I can’t wait to see what she does for the third volume. I’m also glad she hasn’t rushed them out. I know fans want more, right away, but it’s better to get everything right. It’s a great book! And her research is meticulous. You’re right, It’s better to research well and get everything right than to rush the books out.